After a successful launch last year, Art for Animals returns from 19 – 24 October 2018, at Breeze Art Gallery, Jenners, Edinburgh. The event will celebrate Scotland’s magnificent wildlife while also raising awareness of, and funds for, the work OneKind does to protect it. Come and visit us at Art for Animals. 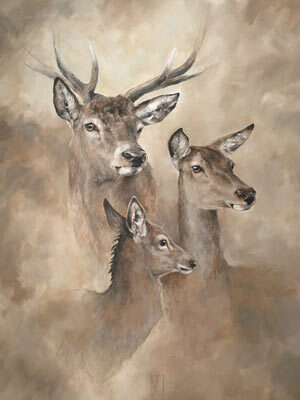 Clare was born in Edinburgh and from a young age has always loved to draw. 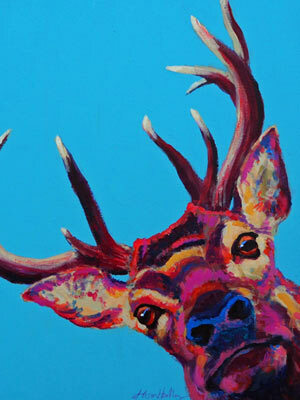 Clare has sold her artwork throughout Scotland including exhibiting at The Pittenweem Festival, Fife at the age of 19. Her inspiration comes from Scottish wildlife and her love of animals. After graduating from Edinburgh College of Art, Clare established her own design business supplying gift shops throughout Scotland. She often creates bespoke work for clients including the MacLeod of MacLeod Clan for Dunvegan Castle, Isle of Skye and The Balmoral Estate. Her range includes stationary, textiles, homeware and gifts. She is continually developing her unique contemporary style, which reflect minimalism. Clare feels passionate about connecting with the dramatic Scottish scenery during the changing seasons, often touring the country as part of her research and creation of new art. Paul is a self-taught artist with a PhD in animal behaviour. Previously an elected member of the Society of Wildlife Artists (SWLA) he won “Artist of the Year” in 2006 and the Langford Press award in 2012 at their annual exhibition at London’s Mall Galleries. He has been a category winner three times in the David Shepherd “Wildlife Artist of the Year” competition in 2009, 2010 and 2018 and overall runner-up twice. 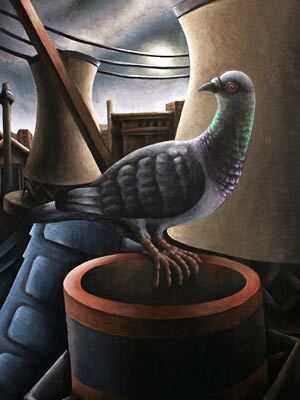 He has also won the ‘British Birds’ category for the “BBC Wildlife Artist of the Year” in 2009. His work has featured in numerous art publications and several books. Paul’s unique eye-catching style is the cumulative result of his experimentation with technique and mediums, combining collage or papier maché with acrylics, pastels, charcoal, sand or even tea! 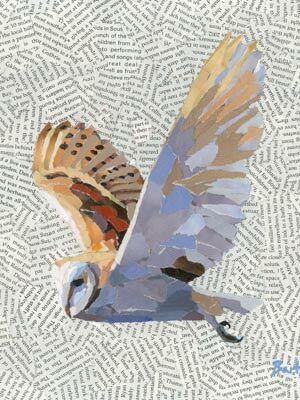 He often uses pertinent publications for his works which educate the viewer on issues of ecology or conservation. Leo is a painter, art tutor and author of two books of art travel writings – one about Scotland, one about Canada. He exhibits throughout the country and has done so since graduating from Edinburgh College of Art Drawing & Painting in 2006. Landscape, nature, environment are his passion and he loves nothing more than being out exploring with binoculars, sketchbook and paints. Leo uses various media but especially watercolour as it’s very portable and is beautifully flowing and exciting to use. In his studio in Burntisland in Fife Leo uses acrylic, oil and watercolour. 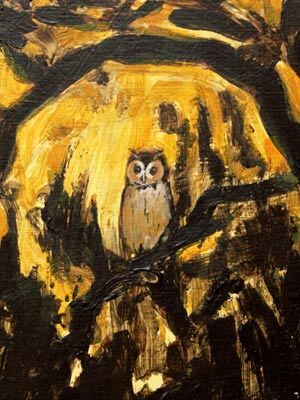 Wildlife is a very big part of who Leo is and birds in particular are often in his art and in the rest of his life. Leo’s involved in lots of environmental campaigning and undertakes regular voluntary bird surveys for the British Trust for Ornithology (BTO). Leo runs art workshops for Edinburgh charity Art in Healthcare and for groups and individuals. He also runs workshops in schools – sketching and painting outdoors with the kids, making wildlife collages, etc. He gives talks about his ScotRail-supported art and nature ‘Scotland by Rail’ travels, and about his work in general. Leo wants his work to inspire people to discover and appreciate nature for themselves. The more you learn about nature the more amazing it all becomes and the more you want to do to help it. Knowing and loving nature is our best hope of protecting what we’re lucky enough to still have left. Jan Ferguson (Watling) was born in 1955 in Wallsend, Newcastle Upon Tyne. In 1985, Jan moved with her husband and two children to Argyll. Moving to this rural area was a dream come true, providing her with a never-ending source of inspiration. A lifetime of dedicated study of all types of animals is evident in her superbly-detailed watercolour and gouache paintings. Supreme control of the media allows Jan to express the vast range of colour and texture in her chosen subjects, whilst at the same time, capturing their personality, beauty and character. Jan has exhibited at the Olympia London, one of twenty finalists in an international wildlife competition organised by the Born Free Foundation and at the Annual National Exhibition of Wildlife Artists (NEWA). 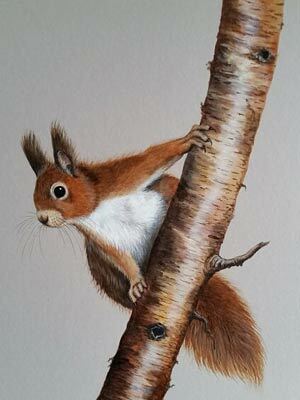 In 2014, she was subsequently selected as a finalist in the British Wildlife Awards and honoured to have been selected to join the Glasgow Society of Woman Artists. Jan is also the chair of the Cowal Red Squirrel Group. Jan was honoured in 2017 becoming an artist member of the Paisley Art Institute and showed work at their annual exhibition May -June 2018. Born and bred in Salop, reared in Ayrshire, James hails from Edinburgh. Studying fine art in St Albans and illustration in Edinburgh, James has taken his ragtag origins and skillsets from games and commercial design through to fine art objects. In game and art hints are made that something has gone awry. Something has been lost in the passage of man, a hint that the barbarian, the savage, and the beast own something too important to be discarded. There is a big scary beautiful cruel kind lump under our carpets, and James is digging. James has exhibited in Edinburgh, London, Ayr, Cowdenbeath, and St Albans in competitions, galleries, commercial art stores, and pubs as well as running a succesful avant garde games site for many years. One of his most successful games put around 100 million children “behind the wheel” of birds. James has four boys, one with severe learning disabilities, a frustrated cat, and an accidental pigeon. Elspeth grew up in the South Ayrshire village of Kirkoswald where from a young age she loved to explore the countryside around her and care for the many animals the family kept. Her passion for horses and drawing began at a very young age, and although she studied art at school she is a mainly self-taught artist and has been drawing and painting now for over 40 years. 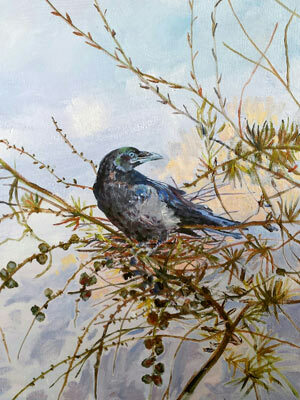 With her love for wildlife and nature she enjoys painting the animals, birds and the natural world around her, however in recent years she feels a strong need to convey the fragile quality of this subject to a wider audience, with so much of our wilderness and its inhabitants under increasing threat. 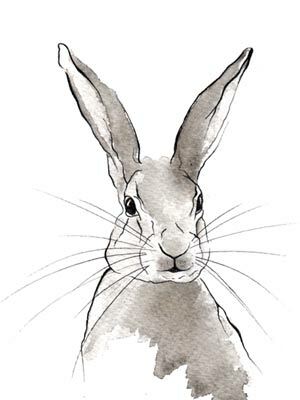 Although Elspeth spends much of her time working on commissions of pets and horses she takes as much opportunity as she can to sketch and paint nature and wildlife. Running the Coach House Gallery along with another two local artists she is in the perfect location to follow her passion as the gallery is located in the grounds of The National Trust for Scotland’s Culzean Castle and Country Park in South Ayrshire. She has exhibited in local South Ayrshire galleries, including The Maclauren at Rozelle, Greenheart Gallery and Off the Wall in Ayr, Many Thanks in Mauchline and the Wellington Gallery in Kilmarnock. In 2015 Elspeth’s equine painting “Tenderness,” won the Art and Joy award at the North Ayrshire Open Art Exhibition. Gemma Hare is a fine artist residing in Aberdeen. After graduating from Edinburgh College of Art in 2005, with a BA (Hons) in Drawing and Painting, Gemma became a teacher, which enabled her to work with creatively with children in a variety of school settings. In November 2017, Gemma started to create her own work again, inspired by everyday objects and experiences, such as people, plants, places and text. She enjoys experimenting with different media and processes, and her paintings explore the use of layering paint and other media and the use of colour. Her paintings have been largely abstract, whilst her collages often focus on the figure. 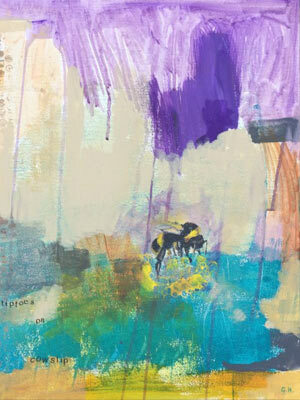 Gemma’s latest work is inspired by the current issue of bee conservation. These paintings still exhibit the painterly qualities and colour compositions shown in her abstract pieces, with a painted bee as a focal point. The images are balanced with text which explores the subject of bee decline and its consequences. Alison (who works under the brand Blue Cow Art) seemed to be born with a passion for creativity. If there was something to draw, paint or build as a child, she did it. After winning prizes for art as young as 10, she went on to study at Edinburgh College of Art. Afterwards, she went into the business world. However, her creativity never left her – it just came out in different ways: how she decorated her family home, how she made presentations during her career and the things she made for her children. However, she has been drawing and painting in earnest again for over 6 years. Alison loves portraying animals – capturing their beautiful energy and character – especially in the eyes. She makes her drawings and paintings anatomically correct, but also painterly and colourful in the interpretation. In the last year, Alison has exhibited at the Art Walk, Porty and has worked on several commissions. Animals are her passion her art helping to defeat cruelty to them is a huge bonus. 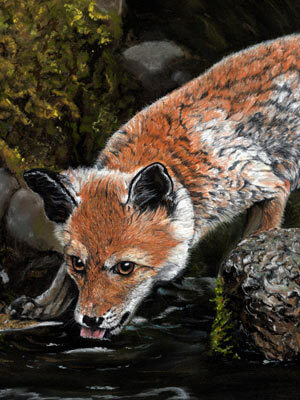 Michelle is known for her detailed animal pastel drawings. Having always being interested in the natural world, she was introduced to Albrecht Dürer’s Young Hare study at an early age and has been drawing and painting animals ever since. The portraits by Rubens are also influential to her, the way the eyes seem to follow the viewer round the room. Eyes are the most important part of any animal or portrait painting to Michelle and she will complete them fully, getting the expression right before working on the rest of the picture. Soft pastels are her favourite medium as they don’t require any drying time and offer a soft definition ideal for fur and feathers although she also works in watercolour and occasionally oils and acrylics. Now living and working in the East Neuk of Fife, she is delighted that her work is grown in popularity and can now be found in private collections worldwide. One of the leading Equine Portrait Painters in Scotland, Madeleine works with breeders and owners of the top horses and ponies in the country. From a family in the Arts she received a continual appreciation and development in fine arts. She left the Home Counties in 1980 to study in the Fine Art Department at Edinburgh College of Art, working in a range of both sculpture and painting learning diversity in the use of materials and style. Madeleine continued to work on small projects but it was not until 2004 that she returned full time to the arts and portraiture. Now living and working in rural Angus, she exhibits her work within the equine showing scene and works full time to commission. An animal’s elegance, power and quiet mysticism is at the root of Madeleine’s work, a sense of peace and natural beauty in a modern chaotic world. Bibo is an artist based in Aberdeen, Scotland. Her work is strongly informed by her deep personal feeling of a connection with nature. In German, which is her first language, this is called Naturverbundenheit. This includes the environment, organic forms in the natural world, animals and the human body. Bibo works in a variety of media (sculpture, video, photography, and live art). Quite often these overlap – for example, she might use a sculptural piece in a performance and then document this through video. When creating sculpture, Bibo is very interested in learning the relevant making processes. 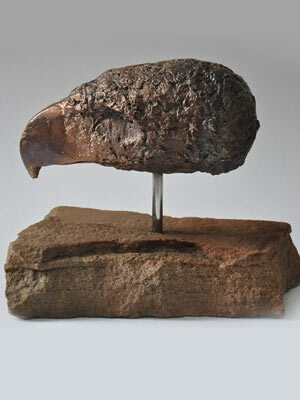 She has a great affinity for clay because of its immediacy and she uses it both as a material in its own right as well as a medium which is then transferred into bronze. Hayley is an artist who lives and has her studio in rural Fife. 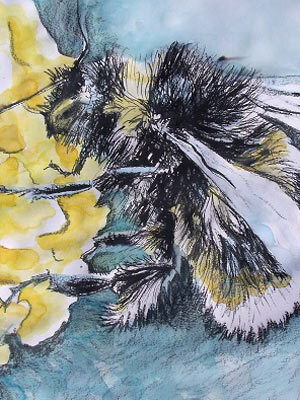 Working with a range of artistic media she creates a mixture of drawing, mixed media and textile pieces. Taking inspiration from the wildlife and landscape that surrounds her and the creative process itself, Hayley works intuitively, which enables the creative process to influence and inform the work making each piece unique. 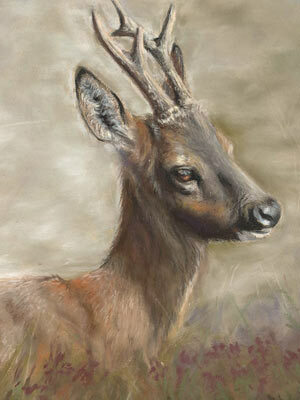 Hayley studied at Grays School of Art; Open Studios North Fife artist; MA (Hons) Philosophy. She sells her work through exhibitions, fairs, privately and through commissions. Romain Pizzi BVSc MSc PhD DZooMed DipECZM MACVS(Surg) FRES FRGS FRSB MRCVS is a specialist wildlife veterinary surgeon and has performed numerous world first wildlife operations, including the first keyhole surgeries on wild moonbears and orangutans. Romain has operated on wildlife ranging from giant pandas and tigers, to sharks, on five continents. The bulk of his work is however with Scottish wildlife and he personally treated almost 4,000 Scottish wildlife casualties last year at the national wildlife rescue centre, from otters to owls. His wildlife surgery work recently featured in WIRED magazine. His art focuses on wildlife and the natural world, and most of his wildlife subjects have been patients he has operated on, from elephants in Sri Lanka and South Africa, to orangutans in Sumatra. He has a particular love for woodcut, and uniquely uses his scalpels and surgical instruments in most of his art works. Susan Smith is a painter and printer (oil, linocut), art tutor and founder of Greenpark Weavers, an off loom tapestry group. Susan studied at Edinburgh College of Art, a member of the SSA, the RGI, AAS and of Fife Dunfermline Print Workshop. She was a finalist in the Scottish Portrait Awards 2017, is a member of the Art Collective Gallery Causewayside. Susan was born and brought up in Aberdeenshire, on a farm, a very outdoor life, encouraging her interest in natural history. Art was all around. Her father sketched, her mother was an oil painter. Earliest memories are the smell of linseed oil and turpentine!! Susan’s son, Leo du Feu, also went to Edinburgh Art College. Both live in Burntisland, regularly working and exhibiting together. Each year they go to the Isle of May with a group of artists leading to a joint exhibition with the group. Susan takes part in Central Fife Open Studios. Studio visits are welcome. Commissions are undertaken. Breeze is a spacious, vibrant, prestigious art gallery based in Jenners, Edinburgh, one of Scotland’s most famous stores. Initially based in Peebles, Breeze expanded to become part of the new Jenners after the store’s multi million pound overhaul in 2008. Breeze now also has branches in Peebles and Loch Lomond. Breeze has become the leading commercial art gallery in Edinburgh, bringing new and exciting art to Scotland’s capital and is a breath of fresh air for any art enthusiast. 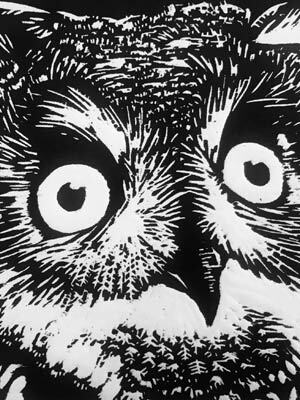 Breeze works with a number of talented artists whose work encompasses a huge variety of media and techniques. Breeze is an art for all gallery and encourages clients of all ages and from beginner to experienced art collectors. OneKind’s long-term aim is for Art for Animals to develop into an important and well-known annual event celebrating wildlife and animal-inspired art in Scotland. Its goal is to raise significant funds for OneKind and our work on behalf of all animals here in Scotland as well as offering selected Scottish wildlife artists an exceptional opportunity to build their profile and sales. The entrance to use to get to Breeze is on the corner of Rose Street and South St David Street. Take lift Number 4 or Number 9 to the 4th floor. Spacious and vibrant, Breeze is situated on the fourth floor of the prestigious Jenners Department Store in Edinburgh. The exceptional venue and knowledge and calibre of the gallery staff, combined with the convenience and accessibility of the central Edinburgh location, make this gallery an outstanding choice. The dates of Art for Animals are Friday, 19 October – Wednesday, 24 October 2018 inclusive. OneKind is Scotland’s leading animal campaigns charity. Based in Edinburgh, OneKind’s work covers Scotland’s wildlife, farm animals, pets and lab animals. OneKind exists to end cruelty to Scotland’s animals. OneKind exposes cruelty and persecution through investigations and research, and ends it for good by giving Scotland’s animals a voice, lobbying for legislative change. How much does it cost to come to the exhibition? It doesn’t cost anything to attend the exhibition. The artists will very kindly donate 30% of the value of all their sales to OneKind. Breeze has waived all charges for the artists and OneKind is extremely grateful to Breeze for their incredible support and generosity. There is no need to get tickets to come to the exhibition, please just turn up. For opening hours, please click here.